Winners and Losers all get fair billing on an ICE LED Scoreboard. Innovative and versatile Score Boards using ICE LED screens deliver stunning performance for your sporting discipline. ICE AV is able to offer LED sports screens for timing, scoreboards and digital advertising. We have LED screen solutions ideal for permanent and temporary installations. In addition we can supply flat panel and a range of projection systems Score Board Solution. LED screens are the only solution that can display bright outdoor images in any size format that can been easily viewed by the spectators and competitors. An ICE LED Screen has the ability to be used as a score board and also a digital display with messages and advertisements, making them ideal for use between scoring events. For the sports event the crucial elements is to have a screen that has legible digits with good clarity making it easy to view the content form a distance. There are a number of factors that must be considered to make this happen. To turn your LED screen into a score board we have software available for the following sports and activities. Our systems ship configured ready for a plug and play experience. We can supply fixed installation, mobile, trailer based and breakdown formats. All our score boards also are supplied with LED screen management software that allows technical changes to be made and also to run the LED screen as a full Digital Signage System. The software allows a range of aspects to be customised including colour selection, logos, team names and the score data relevant to each of the disciplines. Score data can be entered via mouse, HOT key via the key board, touch screen or custom button pads. 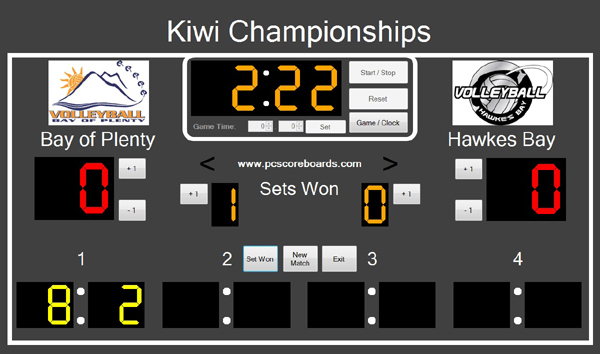 Volley Scoreboard – Scorekeeper Display with score keeping menu. The scoreboard software is easily scaled to the LED screen pixel size right on the desk top, or can be used in full desktop mode if it is scaled via an LED switcher. The optional secondary screen for many of the score boards means that the LED screen output and admin screen can co-exist on the same LCD desktop screen. Whether your score board is used for competitions at national, regional, school club or venue level we can supply a comprehensive solution. For those who can use projection our unique Digital Daytime Lens Concave screens allows high quality images using low cost projectors in very high ambient light level environments as the screens can enhance a projector brightness by up to 2,000% when compared to using a Matt White Screen. This allows dramatic savings compared to our LED screen solutions however projection is not suited for outdoor sunlight. In addition our FastFold projection systems can be desirable in controlled environments, as even a large 3x2m system collapses down into a tiny footprint. For those who wish to make their own rear projection score board our range of ICE projection polymers are an excellent choice.